Dig that funky rainbow, white boy. 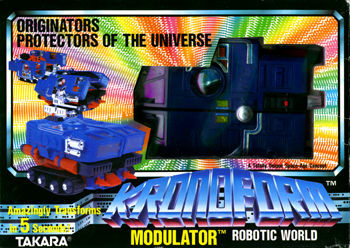 Modulator is one of the nicest of the Kronoform toys. Modulator is one of the Originators, the good guys of the Kronoform line. Modulator seems to have come from the Microman line and still has stickers on the side that say "Cosmo Roller." For more pictures and information, check out the Kronoform pages.